HOUSTON (September 26, 2018)– The Texas Department of Transportation has scheduled nightly closures on Highway 290 from 8 p.m. to 5 a.m. starting Tuesday, September 25 through Monday, October 1, 2018. Houston has had three weeks of weekend rain causing delays with 290 construction. Crews will work overnight during the week in effort to get on track with the projected schedule. The closures are necessary to allow the contractor to open the US 290 westbound mainlanes from Pinemont to West Little York. Starting Wednesday night, work will take place on the eastbound lanes. If you are on the go, be sure to check out our live traffic updates. US 290 westbound mainlanes from Gessner to FM 529 will be closed nightly from 8 p.m. Tuesday, September 25, to 5 a.m. Thursday, September 27. Motorists will be detoured to the Gessner exit, continue on the westbound frontage road and re-enter the mainlanes after FM 529. US 290 eastbound mainlanes from FM 529 to the entrance ramp from Gessner will be closed nightly from 8 p.m. Wednesday, September 26, to 5 a.m. Friday, September 28. Motorists will be detoured to the FM 529 exit ramp, continue on the eastbound frontage road and re-enter the mainlanes after Gessner. Beltway 8 north and southbound direct connectors to US 290 eastbound will be closed nightly from 8 p.m. Wednesday, September 26, to 5 a.m. Friday, September 28. Northbound motorists will be detoured to the West Little York exit, continue on the Beltway 8 northbound frontage road, right on US 290 eastbound frontage road and enter the mainlanes after Gessner. Southbound motorists will be detoured to the West Road exit, continue on the Beltway 8 southbound frontage road, left on US 290 eastbound frontage road and enter the mainlanes after Gessner. US 290 westbound mainlanes from Fairbanks to FM 529 will be closed overnight from 8 p.m. Thursday, September 27, to 5 a.m. Friday, September 28. Motorists will be detoured to the Fairbanks exit, continue on westbound frontage road and re-enter the mainlanes after FM 529. US 290 westbound mainlanes from Bingle to the entrance ramp from Fairbanks North Houston will be closed continuously from 9 p.m. Friday, September 28, to 5 a.m. Monday, October 1. Motorists will be detoured to the Bingle exit, continue on the westbound frontage road and re-enter the mainlanes after Fairbanks. US 290 eastbound mainlanes from the Fairbanks exit to Pinemont will be closed continuously from 9 p.m. Friday, September 28, to 5 a.m. Monday, October 1. Motorists will be detoured to the Fairbanks exit, continue on the eastbound frontage road and re-enter the mainlanes after Hollister. 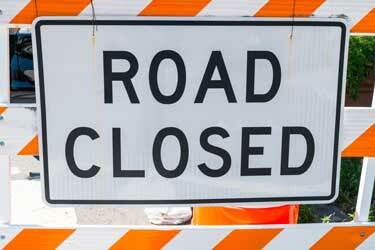 Changes in road closures due to construction can cause delays, impatient drivers, and car accidents. If you or a loved one were involved in car accident, it is important to contact our experienced Houston car accident lawyers. Call (713) 987-7111 or send us an email to discuss your car accident case. Hank Stout is a founding partner at Sutliff & Stout, Injury & Accident Law Firm. Hank earned his doctor of jurisprudence from South Texas College of Law and has been actively trying personal injury cases for over ten years. He was recognized by Thompson Reuters as a Rising Star from 2012-2014 and has been recognized as a Super Lawyer since 2014 (a distinction given to less than 1% of the lawyers in the state of Texas). He has earned a Superb rating by Avvo, and is a member of the Million Dollar Advocates Forum. To learn more, read Hank's full bio here. Disclaimer: The information on this website is for informational purposes only. This website should not be taken as legal advice. Prior results do not guarantee a similar outcome. This information should not be taken as the formation of a lawyer or attorney client relationship.